Increased border security means that all 517 square miles are again open to the public. The “most dangerous national park” has been largely closed to the public for the last 11 years. 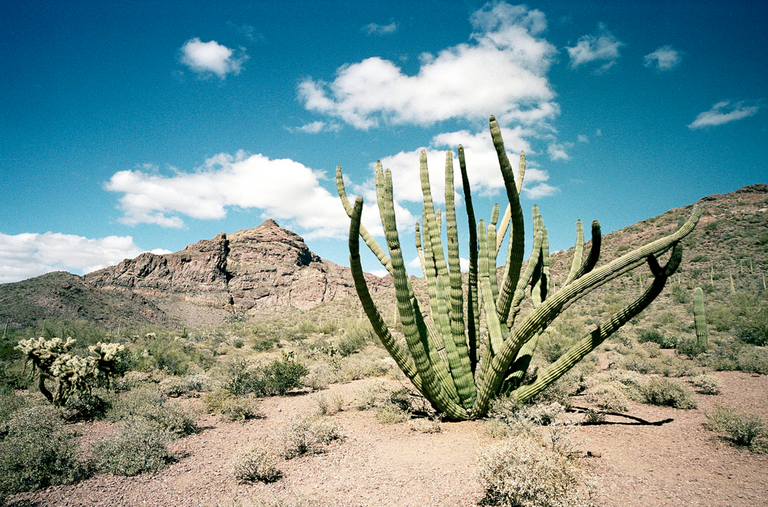 Organ Pipe Cactus National Monument, on the southern Arizona border, once saw a steady flow of immigrants – and drug runners – from Mexico. On Aug. 9, 2002, ranger Kris Eggle was shot and killed while chasing a cartel hit squad, prompting park officials to close nearly 70 percent of the monument in 2003. Some small areas were later reopened. Organ Pipe Cactus National Monument. Photo by Flickr user Christoph Schrief. Organ Pipe, 94 percent of which is designated wilderness, once was traveled mostly by the endangered Sonoran pronghorn and Sonoran desert tortoise. It began drawing both human and drug traffickers in the 1990s, after border security crackdowns in urban areas sent crossers to remote rural areas. As Yahoo News reported, rangers routinely found themselves in high-speed chases, and they seized thousands of pounds of marijuana and other drugs each year – 17,000 pounds of pot in 2005, 100,000 pounds last year. Not surprisingly, the monument’s reputation tended to scare away visitors. Just 210,000 came in 2010. In the wake of 9/11, the new Department of Homeland Security was authorized to construct barriers along the border without having to comply with federal, state or local environmental laws. The Border Patrol also hired thousands of new agents. Organ Pipe now has 20 law enforcement officers, compared to 5 in 2003, and the number of Border Patrol agents in the region has jumped 20-fold, to over 500. The increased border patrols have taken a harsh toll on the park’s environment, though. 2,500 miles of new vehicle tracks were tallied in 2010, although fewer foot trails were created. “The (superintendent’s 2013) report, which maps a spiderweb of tire tracks throughout the park, expressed concern over effects on soil, vegetation, endangered species, cultural resources and wilderness,” notes the Yahoo News story. “Federal environmental laws have also been abused in the name of national security. "Congress and the White House have a taste for it, because they can get away with it," says Dinah Bear, an intense former D.C. insider. She was the chief lawyer for the Council on Environmental Quality, which advises presidents about environmental issues, under Ronald Reagan, George H.W. Bush, Bill Clinton and George W. Bush, and she believes, "This is the most important issue now. They can waive environmental laws that represent 40 years of work and achievement, and take away the rights of citizens to protest it." So, Organ Pipe is once again open to visitors, who will probably face greater danger from dehydration and rattlesnakes than from smugglers. Whether the land will ever be safe from damages caused by the Border Patrol, though, is another question altogether. Jodi Peterson is the managing editor of High Country News. She tweets @Peterson_Jodi.